THE BRIDGE – ARRIVEE SUR NEW YORK A BORD DU QUEEN MARY 2 ET CONCERT A CENTRAL PARK ! The Queen Mary II — the Cunard Cruise Line’s flagship ocean liner — made port Saturday morning at the Brooklyn Cruise Terminal, after taking part in The Bridge 2017 — a trans-Atlantic trip, themed to commemorate the 100th year of World War I, and 100 years of friendship between France and the United States. The route taken was a reversal of the route taken 100 years ago by the first American troops to join the war, who left the port of New York, and arrived in St. Nazaire, France. During the trip, there were several World War I historical presentations and exhibits for the passengers. The voyage was also a friendly race to New York City, between Queen Mary 2 and four multi-hull sailboats, some of the fastest sailboats in the world. The Queen Mary 2 won the race, crossing the finish line under the Verrazano-Narrows Bridge in New York at 5am local time, before bathing in a flawless dawn in New York Bay. The five vessels left Saint-Nazaire, where the Cunard liner was built, on Sunday, June 25. As the ship arrived, the passengers sang a moving rendition of « Amazing Grace » in front of Manhattan, and later that day were able to attend at #thebridge2017 concert, organized as part of the SummerStage NYC festival, in Central Park. The concert featured singer Natalie Dessay-Page, as well as Jean-Christophe Spinosi and his Ensemble Matheus Officiel orchestra. 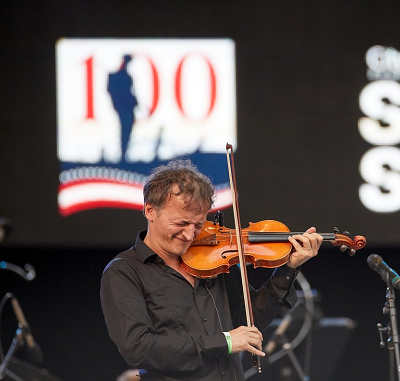 The performing artists paid tribute to the two million American soldiers who came to defend freedom in France, 100 years ago. L’un des plus gros paquebots du monde, le Queen Mary 2, est entré dans le port de New York samedi au petit matin, alors que les quatre grands multi-coques qui sont partis au même moment de Saint-Nazaire pour une course inédite sont attendus d’ici 2 à 3 jours. Le bateau, symbole d’une passerelle entre la France et les Etats-Unis lors d’un événement unique « The Bridge », a passé le pont Verrazzano-Narrows au soleil levant avant de contourner la statue de la Liberté pour faire face à Manhattan. Le QM2 s’est manifesté par 3 coups de sirène et un choeur dirigé par Jean-Christophe Spinosi. Le 2e plus gros paquebot du monde est parti dimanche soir de son port de construction, Saint-Nazaire, où il n’était encore jamais revenu, pour rallier New York en un peu plus de 5 jours. Quelques heures plus tard, à peine débarqués, les passagers de la croisière du siècle se sont donnés rendez-vous à Central Park pour le SummerStage Festival, où l’Ensemble Matheus, orchestré par Jean-Chistophe Spinosi, et Natalie Dessay ont donné un concert en mémoire des deux millions de Sammies venus défendre la Liberté en France en 1917, dans le cadre des commémorations du Centenaire de la Première Guerre mondiale.